Allow me to share with you this Christmas Story, something I put together a couple years ago. Twas seven-hundred and three years before Christmas, and Bethlehem was anything but quiet. With the echoing words of Micah, declaring that a ruler of Israel would be born in the Judean city of Bethlehem Ephratah, suddenly the town became bustling. ‘Day star’, or better known as Satan himself, limited in knowledge, space and power, knew only that this ‘ruler’ was in fact God’s Son. (He knew this only through the reading of the Prophets words.) To the common Jew, Bethlehem was known as the place where Rachel died giving birth to Benjamin, the city where David was not only born, but also anointed King by the Prophet Samuel, and now it is prophesied to be the birthplace of the God’s Ruler. Consequently, Satan begins his effort to trouble God’s plan, as he had persistently attempted hopeless times past. He would call demons from around the world to posses the people and town of Bethlehem, according to the number of demon possessions in the New Testament there might well have been more demons in Bethlehem then Jewish citizens. The little town of Bethlehem was saturated with demons! Satan would be industriously trying to thwart God’s plan, seeking every way possible to locate and devastate this child to be born in Bethlehem. He would labor some 400+ years, never missing a day – for he knew what lay in the balance. As was established by King David, the priest served in the temple by rotation of 24 groups, each serving a month as determined by lot of their own ancestry course. It would be Zacharias, from the course of Abijah, serving the month of October. And now, the time had come, hundreds of years later and God would again speak to His people. According to Luke 1:5 an angel of the Lord appeared to him in the temple saying; Zacharias, do not be frightened, for the Lord has heard your prayer and your wife will bear a son and you will call his name John. Now, scripture tells us also that Zacharias fulfilled his service in the temple before returning home. After returning home Elisabeth, his wife, became pregnant, and Luke 1:24 tells us that she hid herself five months. While this was happening, the ‘Father of Lies’, yes, ole Satan, was still busy frustrating the people of Bethlehem, seeking to destroy their lives, their hope, and more importantly their Savior given the opportunity. It was in Elisabeth’s sixth month of pregnancy that God sent an angel to her cousin, a young girl named Mary. 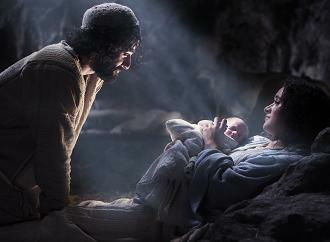 The angel told her that she would conceive a son and that she would call him the Son of God. Now, following a brief question and answer period with Gabriel, Mary went immediately to her Cousin Elisabeth’s house and told her of the good news. It was probably March or April; about six months after Elisabeth conceived John in October. About nine months later in December, God moved upon the heart of Caesar Augustus to have a census. A divine plan to protect the fulfillment of prophecy, the very reason Joseph and Mary came to Bethlehem. Mary and Joseph were coming to the very city that the Devil had been watching and shadowing for more than 400 years; seeking only to murder their child. He and his demons lurked about and hunted out young godly couples who were pregnant. With the census, thousands of people came to the city; so many arriving from all around caused the lodging to be at capacity. They were unable to find lodging at the inn, for it was full. Consequently, they were forced to lodge in a stable and rested there until it was time for Mary to give birth. It may well be that Satan or his demons saw Mary and Joseph or heard of their being in the stable, but he thought he knew God and assumed that He would not use such human sinners to bring the Messiah into the world. Moreover, as Satan recounted the glory of heaven from his experience there as chief cherubim, he concluded that God would never allow His Son to be born in a barn. That evening, as the black velvet skies peeled back and the glistening stars rose over Bethlehem, Mary did give birth to a son and they called His name Immanuel. It was at this time that all heaven rejoiced at the birth, their witnessing God’s incarnation as a child on earth. It was then that an angel appeared to the shepherds in the fields and gave them the news, telling them that this night a savior was born. These shepherds watched over their sheep that roamed the hills just outside of the city. Immediately, following the angel’s proclamation of Christ’s birth, a heavenly host, an army of angels, began singing “Glory be to God in the highest, and on earth peace, good will toward men.” Wow! For all the angels to sing and rejoice like that, it must be no small matter to God. What could be so important that God would have allowed, all of heaven to rejoice – publicly!? According to the bible we are told that the angels rejoice over three things, in Job the angels rejoiced over creation and in Luke the angels rejoiced over the birth of Christ. When this happens we can know that it is no small thing, when heaven rejoices we should pay close attention. The shepherds lay watch over no ordinary sheep that night; they were the temple sheep used for sacrifice. Moreover, it is this precise time of year that sheep give birth, how blessed is it that God’s lamb would also be born at the same time all the other sacrificial sheep were typically born. Some months later, some foreign visitors arrived bearing gifts and seeking ‘the one born king of the Jews’. Of course, their arrival created no small stir among the town people as they openly sought the ‘one born king of the Jews’. It would not be long before Satan heard of these from his demons, and hurry to the scene in hopes of finishing his murderous deed. But God, in His sovereign plan, saw to it that Joseph could take the gifts received from the Magi and finance a trip to Egypt. And it would be there that he, Mary and Jesus would stay and live a typical Jewish life until King Herod was dead, as he did a couple years later. An unusual childhood would have drawn attention to him self, something Satan would have certainly heard about and came running. However, this would not be the case and Satan would not find him. Satan knew only that some Magi had arrived in Bethlehem, and knew nothing of the angelic message to the shepherds or the departing of Joseph and Mary with Jesus. Frankly, Satan had lost Jesus, for some thirty years he continued his toil in the city of Bethlehem. It was not until Jesus, grown and now living in Nazareth, joined John in the waters of the Jordan River. And following the Holy Spirit’s nudging of John to declare “Behold, the Lamb of God who takes away the sin of the world!” that Satan would find out of Jesus’ whereabouts. It was at this point in history that God finally seemed to say, “There He is devil”! Take your best shot. With no surprise to God, the Devil did try and it almost seemed he had succeeded. However, It would only last two and a half days, and on the would-be third day of Satan’s hopeful triumph, God raised His Son as victor and Lord over death, hell, and the grave. Today, the Devil is still lurking about in Gallatin and in Bowling Green, seeking to steal, kill, and destroy. Because of the Christmas gift we received from God some two-thousand years ago, man-kind need no longer worry about going to hell for their sin. Anyone that goes to hell now, goes only because they have chosen to disbelieve. Jesus is real, He is alive, and He is coming again. Oh, and one last thing. Remember I said there were three things that the angels rejoiced over? Well, the bible says they not only rejoice over Creation and Christ’s birth, but heaven rejoices over every person who repents of their sin and places their faith in Jesus (Luke 15:7-10). That means that every person who accepts God’s Christmas gift, Jesus, is as important to God as His Son’s birth and His Creation of the whole universe. For it to be that important, He must really love us – a lot! And although we do not know for certain the day nor month Christ was actually born, we do know and accept that He was indeed born to die for our sins, and in that we celebrate each year at Christmas.